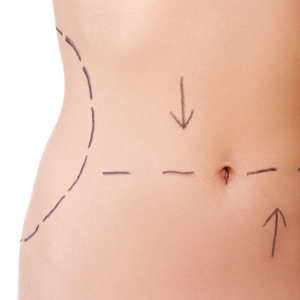 Who benefits from tummy tuck surgery? Clients who want to have a flatter, tighter, more contoured abdomen and narrower waist. This is especially helpful for women whose stomach muscles have changed after pregnancy or individuals who have drooping or sagging skin after weight loss, aging or pregnancy. Clients who want to remove belly fat cells to keep internal organs functioning properly without added toxins, pressure and fatty acids. Clients who want to increase self confidence that comes with the enhanced abdominal shape. Clients with stretch marks and wanting to remove it by either removal of the affected skin or tightening of skin. The tummy tuck procedure is generally performed under general anesthesia. During tummy tuck surgery, a horizontal incision is made just above the pubic hairline. The length of this lower abdominal incision is determined by the amount of excess skin. The skin is then dissected up toward the rib cage, the muscle is tightened, the belly button is repositioned and excess skin is removed. Dr. Boonchai may also recommend combining liposuction with your tummy tuck procedure for the best results. Drains are most often used and are removed several days following the procedure. Protect your health prior to surgery. Even a simple cold could cause complications with the anesthesia. If you do develop an illness right before your surgery, let your surgeon know. You may need to postpone your tummy tuck surgery until you feel better. On the day of your procedure, do not wear any skin care products, makeup, deodorant, perfume, nail polish or powder. After your tummy tuck procedure is completed, dressings, bandages, and binder will be in placed around your tummy and waistline to provide additional support and lessen the movement and the resultant discomfort.